CAECILIUS (CAECILIAN), (Third Century), a priest in Carthage, Africa Proconsularis. In his last years St. Caecilius catechised and then baptised St. Cyprian of Carthage (16th September). Always more than a spiritual father to St. Cyprian, following St. Caecilius’ repose St. Cyprian cared for his wife and children. St. Jerome (30th September) says that the saint was the reason St. Cyprian added Caecilius to his name. CLOTILDE, the daughter of Chilperic I, King of Burgundy (r. 473–480), and wife of Chlothar I, King of the Franks (r. 558–561). 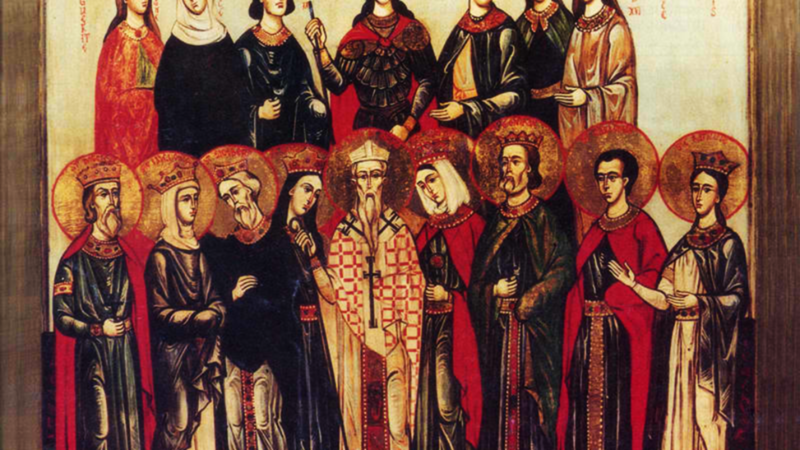 Chlothar was a pagan at the time of their marriage, and St. Clotilde taught her husband about Christ, resulting in Chlothar becoming a Christian himself, as well as the first Christian King of the Franks. Following the repose of Chlothar in 511, St. Clotilde retired to the tomb of St. Martin (11th November) in Tours, where she devoted the rest of her life to a life of charity and piety. St. Clotilde reposed in 545. COMINUS, (Second Century), one of the Martyrs of Lyons and Vienne, most of whom are commemorated on (2nd June). St. Cominus was mauled to death by animals in 177 in the amphitheatre of Lugdunum, Gaul (present-day Lyons France). CRONAN, St. Cronan was a disciple of St. Kevin (vide infra) at Glendalough in Co. Wicklow, Ireland and reposed in 617. Nothing further is known of his life. DAVINUS, a native of Armenia, who sold all his possessions, giving the proceeds to the poor. St. Davinus then set out on a pilgrimage to Rome and then on to Compostella. Stopping along the way at Lucca in Tuscany, St. Davinus was stricken by an ailment which proved to be fatal. St. Davinus reposed 1051, and was buried in one of the town’s churches. GAUSMARUS, Abbot of the Abbey of St. Martin of Savigny from 954 until his repose 984. GENESIUS, upon completion of his education St. Genesius renounced the world for an ecclesiastical life. He served as Archdeacon of Clermont, in Auvergne, then in 656, St. Genesius was consecrated Bishop of Clermont. While Bishop, St. Genesius fought the heresies of Novatian and Jovinian, founded a hospital at Clermont, the Abbey of Our Lady of Manglieu or Manlieu (men), the Abbey of Chantoin (women), as well as the church of St. Symphorian, now called St. Genesius. St. Genesius reposed 662 and was buried in the church of St. Symphorian. 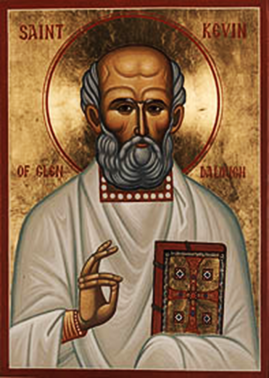 GLUNSHALLAICH, St. Glunshallaich is famous in Ireland for having repented of his evil ways; he was converted by St. Kevin (vide infra), with whom he was buried at Glendalough in Co. Wicklow. St. Glunshallaich reposed 617. HILARY, a fourth century Bishop of Carcassonne in the Occitanie. While Bishop, St. Hilary worked to prevent the spread the Arianism in his diocese. ISAAC, a native of Cordoba, and a Christian, St. Isaac’s proficiency in Arabic enabled him to have a high-ranking Moorish government position. Nevertheless, he resigned to enter monastic life, entering a monastery in Tabanos not far from Cordoba. A few years after he was tonsured, St. Isaac got caught up in a public debate on religion, during the course of which he denounced Mohammed, for which he was martyred in 852.
taught by another, and buried by a third. to help, support, and guide us in the way of salvation. praying unceasingly for us all. KEVIN (COEMGEN, CAOIMHGHIN), our venerable father Kevin of Glendalough, Wonderworker of Ireland, was the founding Abbot of Glendalough and is one of the patron saints of Dublin. Though sources for his Life are late and unreliable, it is generally believed he was born in Leinster to a noble family, and was educated by St. Petroc (4th June) during the latter’s stay in Ireland. After ordination to the priesthood, St. Kevin spent seven years as an anchorite in a cave now known as St. Kevin’s Bed near Glendalough. He went on to found what grew into the famous monastery of Glendalough, parent of several other monasteries and destined to become, with its seven churches, one of the chief centres of pilgrimage in Ireland. It is said he reposed 618 at the age of one hundred and twenty. LIPHARDUS (LIFARD), after a successful career in the Orléans government, in which he held several high-level positions, St. Liphardus left the world to enter the Church. After ordination to the Deaconate, he withdrew to live as a hermit just outside of the city. Later after being ordained to the Priesthood, disciples began to gather round St. Liphardus for whom he founded a monastery at Meung-sur-Loire, and served as its first Abbot. St. Liphardus reposed circa 550. OLIVA, (Date Uncertain), a nun at Anagni near Rome, of whom nothing further is known. PERGENTINUS and LAURENTINUS, two brothers who were martyred in Arezzo in 251, during the Decian Persecution.